Seven Red Arrows in a line, with “RedOne” just slightly ahead as he flys the lead aircraft. Those of you who watched the Channel 5 documentaries recently, may remember that his name is Martin Pert ( Perty). When they are flying in formation, the aircraft are approximately 6 feet apart! 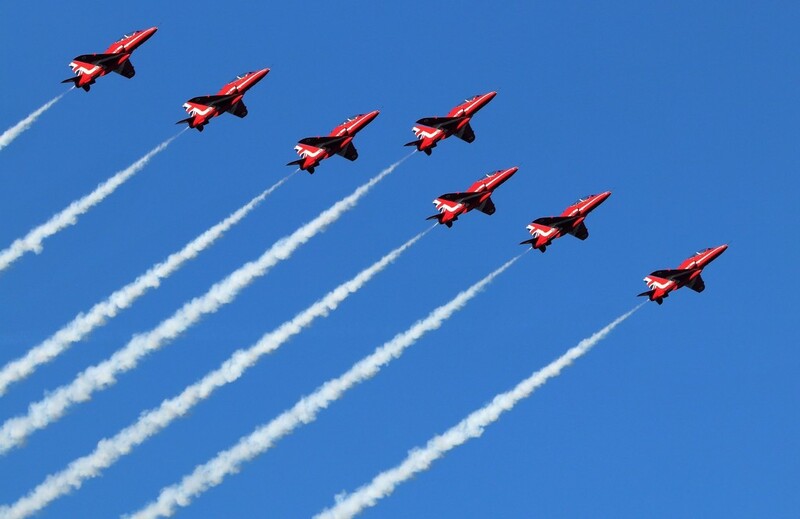 Something about The Red Arrows when the sky is blue. The colour is just so marvellous. Wow! That’s a fabulous capture. You’ve really got these red arrows cracked. Fab composition. Yours and theirs! Carole, this is so fantastic. I love the sun shining on the planes.